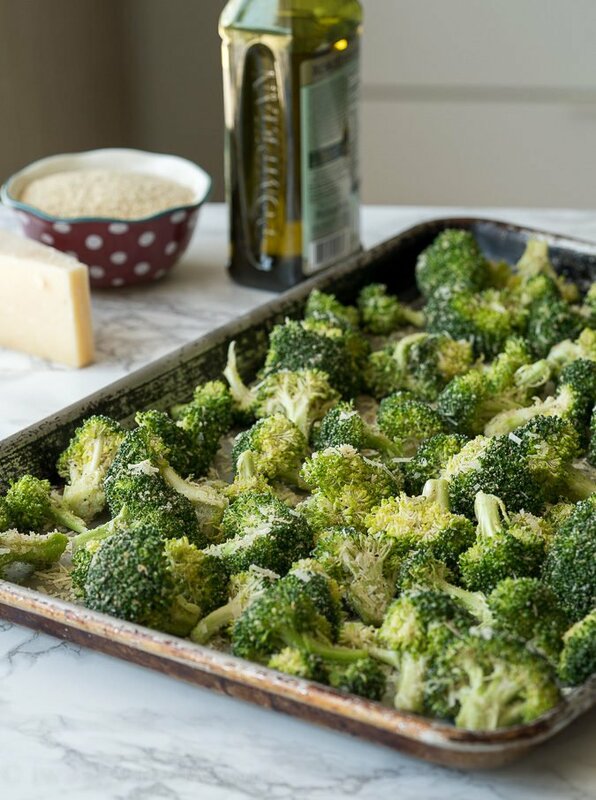 Parmesan Roasted Broccoli is a quick and easy side dish vegetable that is constantly requested in our house. 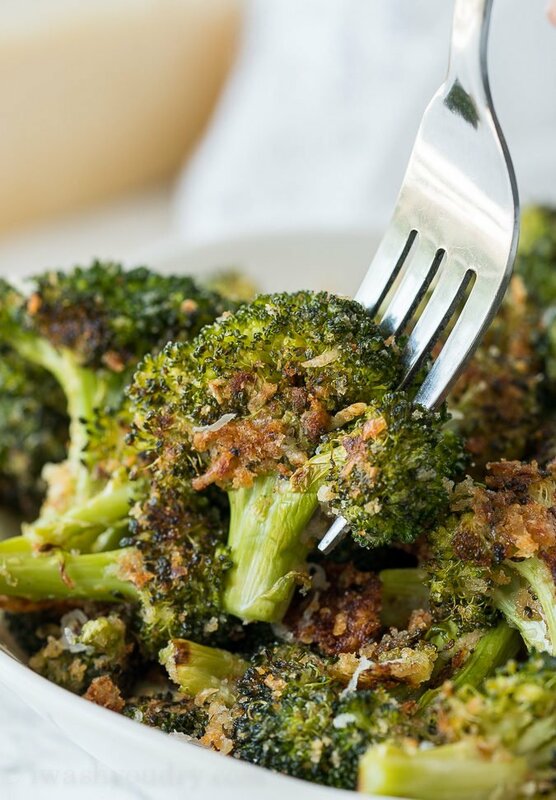 Parmesan Roasted Broccoli has quickly become one of my new favorite ways to eat broccoli. It’s crazy how addictive this broccoli is! 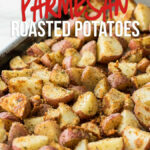 If you haven’t tried any of my other parmesan roasted vegetables before, than you’re missing out. I’ve got you covered with Cauliflower, Brussels Sprouts, Asparagus and even Potatoes. But now you’re in for a real treat with this broccoli! I think what I love the most about these side dishes is that there is virtually no dirty dishes to clean up! Toss all the ingredients in a disposable bag, line a baking sheet with foil, and voila! You’re off the hook for dishes! Now, if you’re concerned about using plastic bags, then by all means, go ahead and mix this up in a bowl. Over the years I’ve received a few questions that come along with these roasted vegetable side dishes, so I’ll go ahead and address them right here. “Can I use frozen broccoli in place of fresh?” – In order to get the best results, stick with fresh. If you have to use frozen, roast them longer until the moisture has been released. “Do I have to use breadcrumbs?” – You can skip the breadcrumbs if you’re trying to avoid gluten, try replacing them with crushed pork rinds! “Can I use the canned parmesan cheese instead of the shredded parmesan?” – This recipe works best with the shredded parmesan (freshly shredded is best). There’s something magical happened when I baked broccoli at high temperatures. The outsides get a beautiful crispiness to them, while the insides remain tender and delicious. My kids and I absolutely adore this method of cooking. 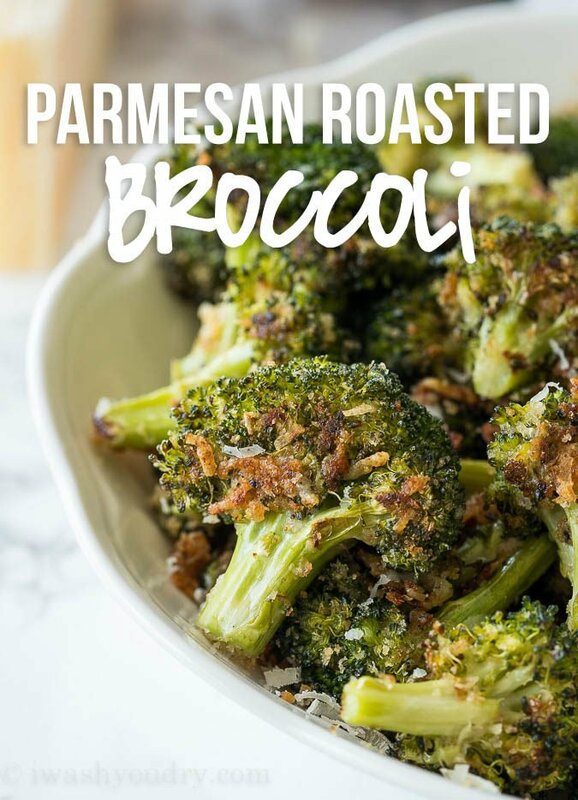 Pair this Parmesan Roasted Broccoli with any dish you’re sure to have a happy family… and happy tummy! 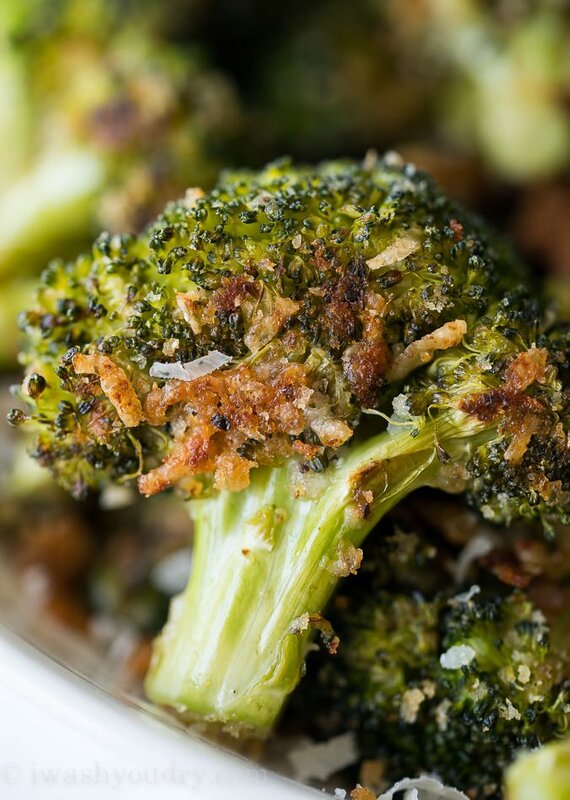 Parmesan Roasted Broccoli is a quick and easy side dish vegetable that is constantly requested in our house. Preheat oven to 425 degrees F. Line a baking sheet with tinfoil and coat with non-stick spray. 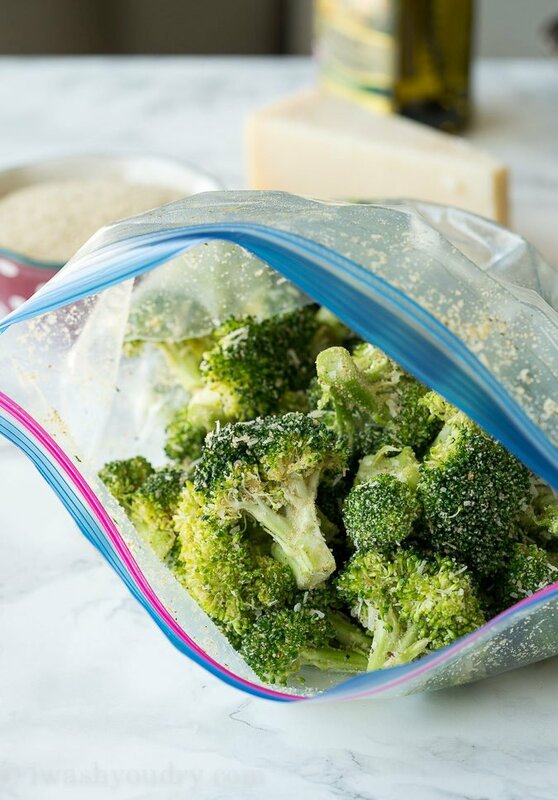 Combine the broccoli and olive oil in a large zip close bag and shake to coat. 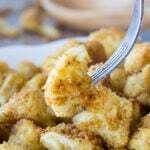 Add the breadcrumbs, parmesan cheese, garlic powder, salt and pepper to the bag and shake to coat. Use your hands to rub the bag and help the coating to stick to the broccoli. Spread the broccoli in an even layer on the baking sheet, picking up any coating that’s on the bottom and dispersing it over the broccoli as needed. 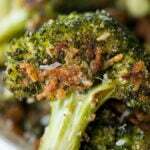 Bake for 12 minutes, then stir and flip the broccoli, bake for an additional 10 to 15 minutes, until crisp-tender. Enjoy! Hello, I’m planning making this for Thanksgiving Day at my house and then transfer it to my daughter-in-law and son’s house for dinner. Can I make it ahead of time and then place it in a casserole type Crock-Pot to keep it warm until dinner? Looks delicious for my Jewish new year dinner tomorrow for 30 people. Can I make I. The morning and reheat. Currently my boyfriend and I are living on a budget and he hates broccoli. However, he enjoyed this recipe a lot! We used a hamburger bun and tore it up because we didn’t have Italian style breadcrumbs but it still did the trick. Highly recommend this recipe to finicky eaters on low income! Delicious! I substituted almond flour with a little dried basil and some Italian seasoning for the breadcrumbs to make it Keto friendly. It was was big hit with my husband! Thank you for sharing this with us! Love that idea for a Keto version! So glad you enjoyed it! I love this recipe any idea on the calories per serving? What temperature I can cook in oven with fan? Can frozen broccoli flowerets be used? I used frozen broccoli and it turned out fine.